Players that are considered to be MustHave’s that top this list are the equivalent of Chalk plays for today’s contests. We breakdown these items for each position knowing that you won’t be able to take all of these players but this will give you the best chance to ensure you have selected from the projected top players for today. As we move into the Notable category, now this is where you separate from cashing and from losing. The need for at least 3 players in this category means that you have to ensure you take the guys that typically average between 25 fantasy points per game and 33 fantasy points per game, that have the highest chance of going for 40 points or more tonight. The sleeper category is where you now look to separate from the bottom of the cash pile to the top of the cash pile. For daily NBA contests, this usually means finding the guy(s) who have a higher point per minute than the average and are expected to play more minutes, either because of injury to other players or their average minutes played per game is trending up. To download today’s DraftKings Absolute Player Breakdown report click here. 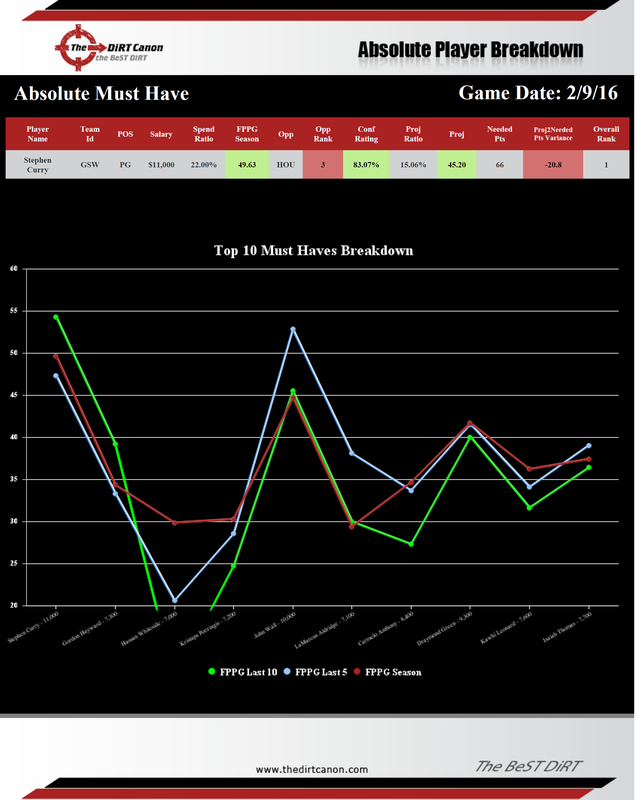 To download today’s FanDuel Absolute Player Breakdown report click here. The next set of information that should be reviewed are the value plays for today’s games. Most fantasy sports information sites have their own value system, which takes their projection and divides that by the assigned salary. Here at The DiRT Canon, we go above and beyond standard metrics that really don’t give you much information and instead we look to provide a more in-depth analysis of value. In processing the results of thousands of contests at all levels of entry fees, The DiRT Canon, has been able to identify the minimum winning score on average, weighting several factors such as number of games played, overall rank of teams playing, Vegas odds, projected over-under scores and much more in order to forecast the needed score to win tonight. This will be further provided in future releases to our customers and to sign up just click here and enter Promo code WIN. Now that we have the projected score needed to win, we can now look at the assigned salary in order to determine the Needed Points, that each player will need to achieve in order to be worth the assigned salary for each daily fantasy site. Then we take our Overall DiRT Canon projection and subtract that value from the Needed Points in order to determine if that player has value or not. When you are able to identify players that have high average fantasy points per game and are of value for today’s games, these are the strongest plays you can find. When you have lower salaried players with high variances in this area, these are also players that should be considered in building your lineup. 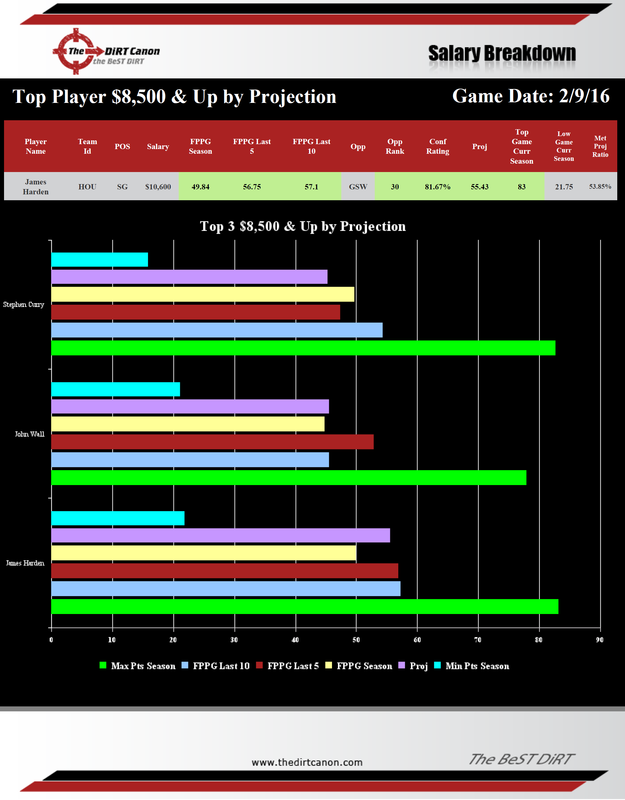 To download a copy of today’s DraftKings Projection-2-Spend report click here. 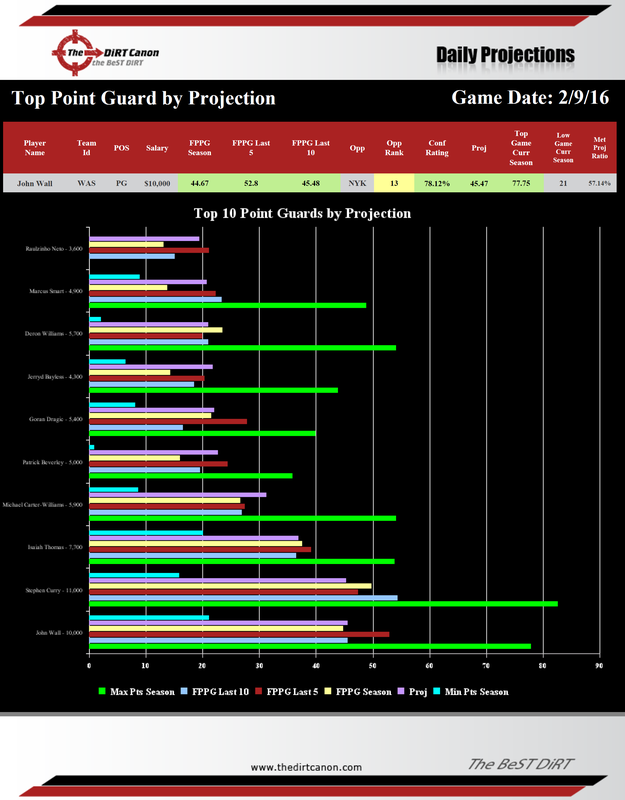 To download a copy of today’s FanDuel Projection-2-Spend report click here. This analysis is as straight forward as it gets from us. This is our daily projection for players that are eligible for contests tonight. This information is broken down by position so you are able to quickly identify the players that have the highest projection. The one factor that The DiRT Canon brings to the table that no one else considers is the fact that we have a projection that is based on the Last 5 games, Last 10 games, Full Season and the we have a custom Overall Projection. 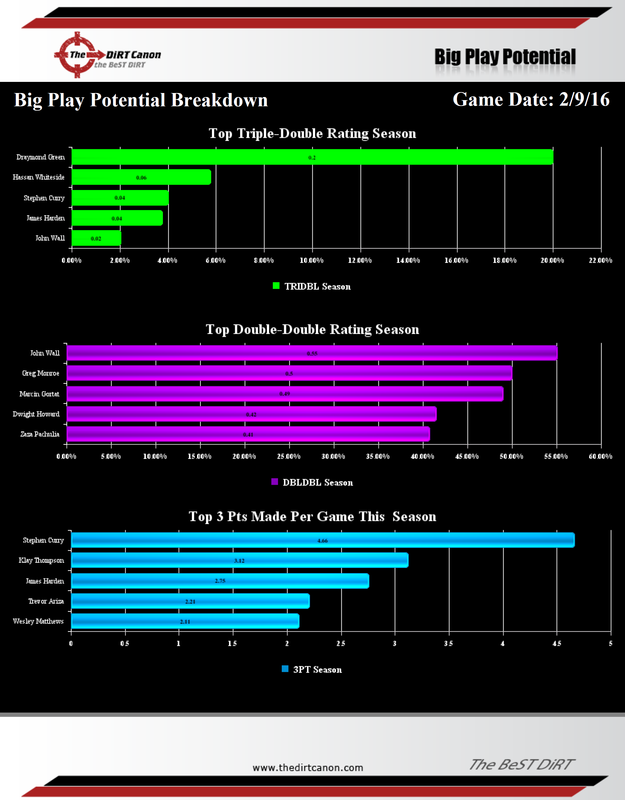 At a glance this will give you a trending perspective for each player that visually you are able to determine who you should select. To download a copy of today’s DraftKings Daily Projection report click here. To download a copy of today’s FanDuel Daily Projection report click here. In this section, we provide the ability to find players, regardless of position at a specific salary range. This ultimately allows for you to make some of your final lineup selections as you look to compare the projection and expected performance of players within a certain set of salary ranges. Have only $5,500 dollars left, you can find the best guy at that salary. Can’t be more simple than that as we include the projections and value for these players to make this selection process as easy as possible. 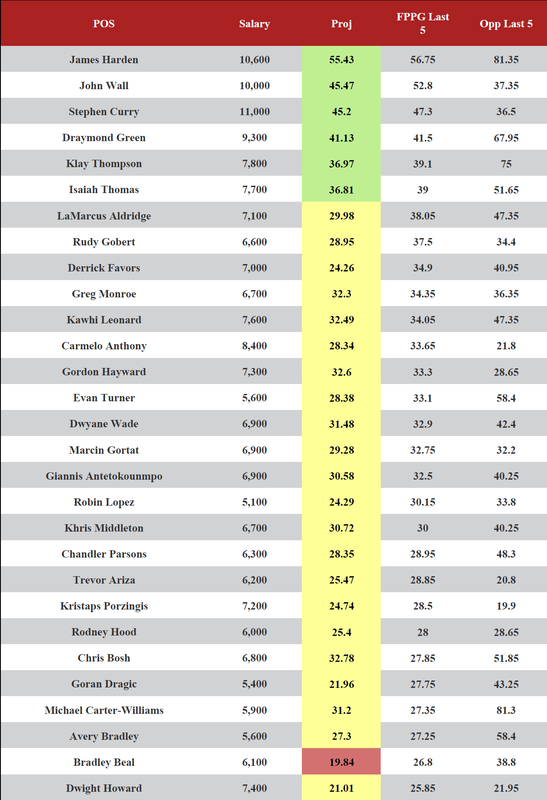 To download a copy of today’s DraftKings Salary Breakdown report click here. To download a copy of today’s FanDuel Salary Breakdown report click here. The full version of the Big Play Potential and this should be a highly used set of information specifically for DraftKings as this will be a big indication for having players hit those all important bonuses. The top Triple-Double guy for tonight is Draymond Green with a 20% chance of hitting this mark tonight. The top Double-Double player for tonight is John Wall with a 55% projected rating. The top 3 point shooter for tonight is Steph Curry with a projected 4.66 three’s tonight. Be sure to check out the detail of this report as you will get to see how players are trending in their last 5 and last 10 games relative to these categories. To download a full copy of this report, click here. In this section we will provide a quick breakdown of those players that have the highest, last 5 game average for fantasy points so you can see if there are players that are playing well of late that you should consider when building your lineup(s) for today’s contests. James Harden and John Wall are the only players currently over the 50 point marker. Curry, Green and Thompson are ranked 3, 4 & 5 respectively on this list with Green having the best matchup for tonight. Robin Lopez has the lowest salary at $5,100 that is over 30 fantasy points per game over his last 5. In this section we will provide you with the FanDuel and DraftKings positional analysis based on players that are available for today in order to better assist you with the order in which you should be selecting player as you create your winning lineup(s). 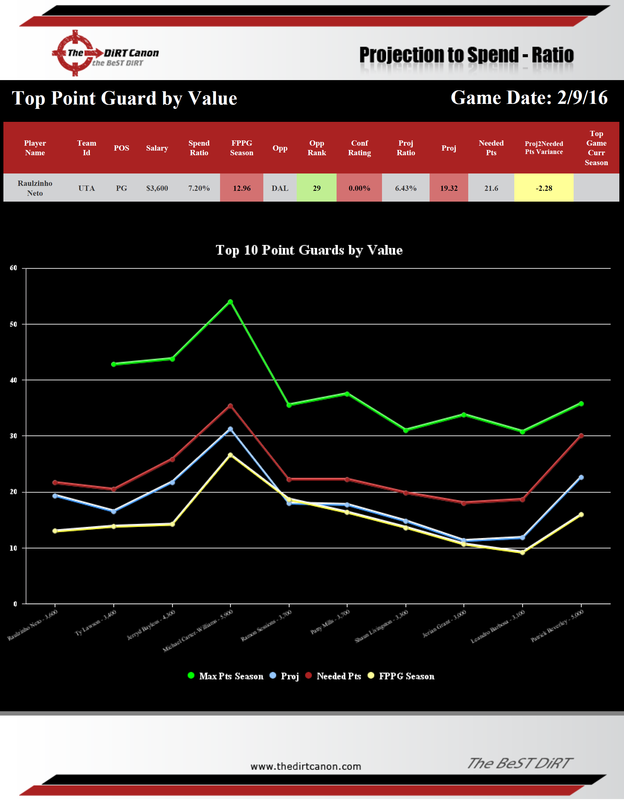 PG – Represents 22.21% of your projected team point total with an average of 2.13 PG’s per winning lineup over the past 7 days. SF – Represents 19.8% of your projected team point total with an average of 1.38 SF’s per winning lineup over the past 7 days. PF – Represents 20.54% of your projected team point total with an average of 1.96 PF’s per winning lineup over the past 7 days. C – Represents 14.31% of your projected team point total with an average of 1.04 C’s per winning lineup over the past 7 days. Order for tonight, based on percentage of projected points would be SG, PG, G, PF, SF, F, C with a projected score of 294 to cash in main tournaments at 95% chance of winning. PG – Represents 22.37% of your projected team total with an average of 71.8 points for this position for winning lineups. SG – Represents 22.06% of your projected team total with an average of 70.8 points for this position for winning lineups. SF – Represents 18.73% of your projected team total with an average of 60.1 points for this position for winning lineups. PF – Represents 23.65% of your projected team total with an average of 75.9 points for this position for winning lineups. C – Represents 13.19% of your projected team total with an average of 42.3 points for this position for winning lineups. Order for tonight, based on projected points per position would be PF, PG, SG, SF, C and the number for tonight is projected to be 321 to cash in main tournaments at 95% chance of winning. Hassan Whiteside: UPDATE: Whiteside (ankle) is considered a game-time call for Tuesday’s matchup with the Spurs, Jason Lieser of the Palm Beach Post reports. Tim Duncan: UPDATE: Duncan (knee) is officially listed as questionable for Tuesday’s matchup with Miami. Nene Hilario: UPDATE: Hilario (calf) went through a full practice Monday, J. Michael of CSN Mid Atlantic reports. 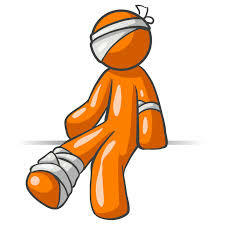 Trey Burke: UPDATE: Burke (illness) will not play in Tuesday’s game against Dallas, Jody Genessy of Deseret News reports. Terrance Jones: UPDATE: Jones (concussion) is doubtful for the Rockets’ last three games before the All-Star break, Calvin Watkins of ESPN.com reports. Don’t forget to check back for our 5 Point Play @ 6:00 EST, our daily NBA DFS insight, as you set your lineups prior to the first tip off tonight.